A federal government bureau holding hearings over President Donald Trump’s plan to open most of the nation’s coastline to oil and natural gas drilling has defended the plan despite boisterous protests. Drilling opponents held their own meeting in Hamilton, New Jersey, on Wednesday before a Bureau of Ocean Energy Management meeting began. They’re upset the bureau won’t allow them to speak at a microphone. 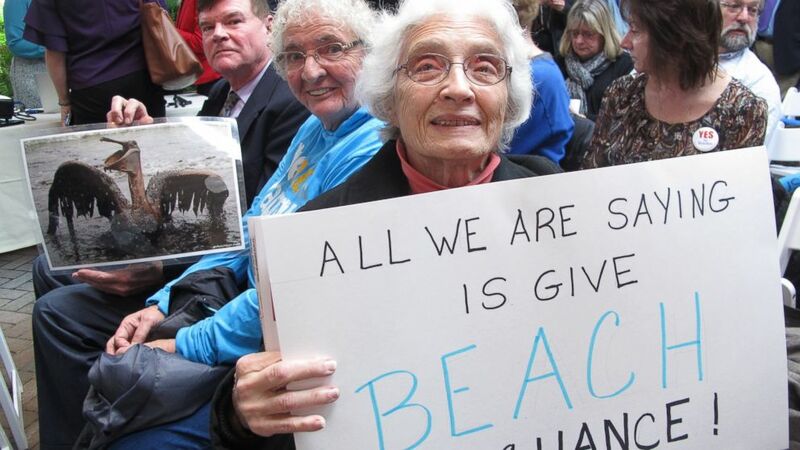 The Democratic governor issued the message to the Republican president Wednesday while addressing an environmental rally by video link before a U.S. Bureau of Ocean Energy Management meeting. Opponents of Trump’s plan to open most of the nation’s coastline to oil and natural gas drilling have staged boisterous rallies before the bureau’s public meetings because the public isn’t allowed to speak at the meetings. The bureau allows people to comment online or hand in written comments but won’t allow them to get up at a microphone. Trump’s decision on oil and gas drilling has horrified environmentalists. But energy groups and some business organizations support it. Opponents of President Donald Trump’s plan to open most of the nation’s coastline to oil and natural gas drilling have held boisterous rallies before public meetings held by the federal government on the topic. That’s because the public cannot speak to the assembled attendees at the meetings. The U.S. Bureau of Ocean Energy Management is meeting one-on-one with interested parties and allows people to comment online. Because drilling opponents can’t address the room, they’ve been holding their own meetings. The latest will take place on Wednesday in Hamilton, New Jersey. The bureau says its chosen format is more effective than formal oral testimony.